In the first week of February, we travelled to SpinExpo’s first Spring/Summer showcase in Paris at the Cite de la Mode et du Design, the city’s creative space on the banks of the Seine in the 13th Arrondissement. This is the third exposition by SpinExpo in Paris, following two successful Autumn/Winter expos in 2017 and 2016. 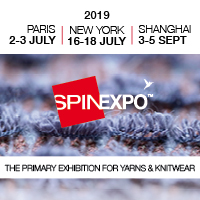 With her passion for fashion, and what it means in sociology, founder and organiser of SpinExpo, Karine Van Tassel, curates 53 mill and manufacturer exhibitors, mainly from the Far East. Fairly uniquely to SpinExpo, the focus is on creativity and trend resources. For Spring/Summer 2019, the focus was based around 5 directions for yarn, colour and knit, influenced by the notion of a ‘sensual future’. One where we focus on emotionally-driven design and product.